What Does Code P0080 Mean? For the internal combustion engine to function, the valve system opens and closes the cylinder at different points in the cycle. On the intake stroke, for example, the intake valves should be open, allowing air and fuel to enter the cylinder. On the compression and power strokes, both intake and exhaust valves are closed. Finally, on the exhaust stroke, the exhaust valves open to allow the exhaust to escape through the exhaust manifold. Granted, this is an oversimplification, because we have to recall that the cylinders are moving fast, so the valves actually open and close before or after those strokes have begun and ended. In the typical engine intake stroke, the intake valves open (IO) 8° BTDC (before top dead center), allowing air and fuel to enter from the intake manifold, and the exhaust valves close (EC) 10° ATDC (after top dead center). On the compression stroke, the intake valves close (IC) 44° ABDC (after bottom dead center). 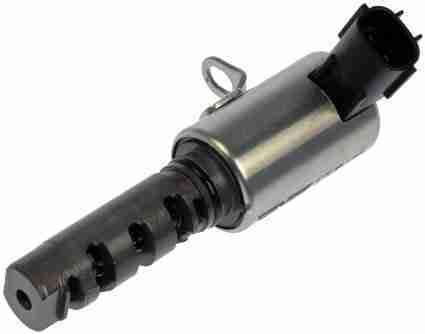 The spark plug fires, and the power stroke forces the piston down, and the exhaust valves open (EO) 50° BBDC (before bottom dead center). The exhaust stroke forces spent gases out the exhaust manifold, and the cycle starts again. This works fine on a typical medium-performance engine, such as found in any sedan on the road today. 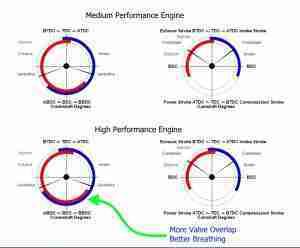 On the other hand, performance engines, perhaps in a sports car, would benefit from different “breathing” habits, and performance engineers discovered that, by changing valve opening and closing angles, they could squeeze more power out of the engine. 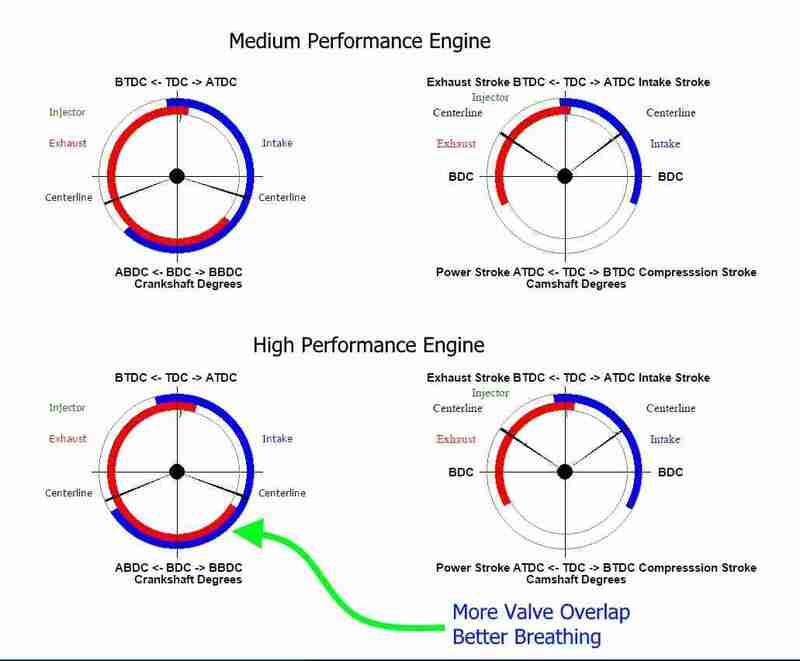 A performance engine’s valve opening and closing angles might be something like this: Intake IO 17° ATDC & EC 17° ATDC, Compression IC 59° ABDC, Exhaust EO 59° BBDC. Engines destined for performance applications might get a cam profile like this, but the engine would not perform as well when cruising, for example. To get the best of both worlds, performance on demand and cruising fuel economy, most modern engines are equipped with variable valve timing (VVT). Depending on engine speed and load, the engine control module (ECM) adjusts valve timing, some VVT systems affecting only intake valve timing, while others varying both intake and exhaust valve timing. To control valve timing, the ECM modulates a VVT solenoid valve. In turn, the VVT solenoid valve controls engine oil pressure application in the VVT head, mounted on the camshaft. 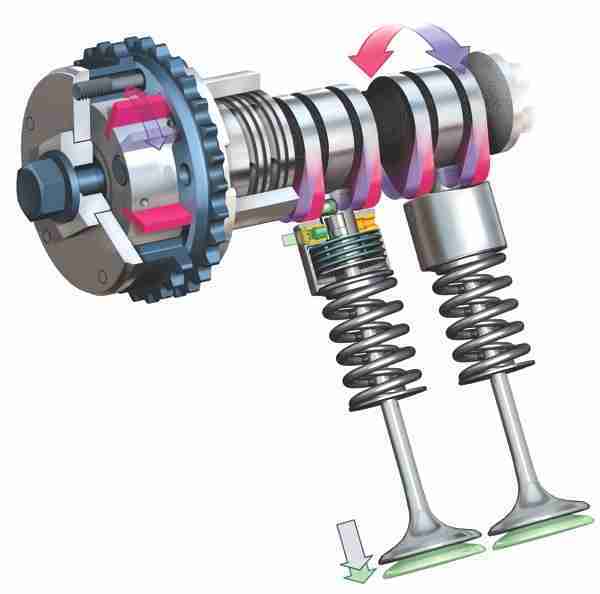 Depending on system design, VVT can advance or retard valve timing. If the ECM detects a fault in the VVT solenoid valve circuit, such as voltage out of specification, it will set a diagnostic trouble code (DTC), P0080 Exhaust Variable Valve Timing (VVT) Control Solenoid Circuit High (Bank 1), and illuminate the check engine light (CEL). Keep in mind that Bank 1 refers to either an inline engine (most four- and five-cylinder engines, and some six-cylinder engines) or the bank of cylinders containing cylinder #1 (V6, V8, and V10 engines). What are the common causes of code P0080 ? Depending on year, make, and model, DTC P0080 may have number of causes. Here are some of the most common. Circuit Problems – Wire harness and connector damage are the main causes of this VVT failure. Poor repair practices and rodent damage are common causes of this type of damage. VVT Solenoid Valve Problems – The main failure here is an open circuit in the solenoid coil. What are the symptoms of code P0080 ? Depending on system design, aside from the CEL, you may or may not notice any drivability symptoms. Usually, if the ECM cannot control the VVT, it will simply lock into a base position. The engine will usually run fine, but you may notice rough idle, poor performance, or poor cruising fuel economy, whether because of VVT failure or for the engine running in “limp home” mode. How do you troubleshoot code P0080 ? Because this DTC references a circuit problem, you will use a DVOM to diagnose the problem. The main focus of your attention should be the circuit between the ECM and the VVT solenoid valve, as well as the solenoid valve itself. Connector and Harness Check – Check that the VVT solenoid valve connector is good, no bent or backed-out pins, corrosion, or water entry. Make sure the connector is firmly seated. Check the wire harness for damage, chafing, exposed or broken wires. Repair as necessary. Voltage Check – With the engine running, you should have a minimum 13.4 V at the battery. Backprobe the VVT solenoid valve, usually located in the cylinder head or valve cover, and check for battery voltage. If voltage is incorrect, suspect an open circuit between the ECM and the valve. Disconnect the connector and recheck for battery voltage. If incorrect, suspect an open circuit between the ECM and the valve. Inspect the wire harness and repair as necessary. If voltage is correct, suspect a ground problem. With the key off and engine off, disconnect the VVT solenoid valve connector and the ECM connector. From the VVT solenoid valve connector, check both pins for short to each other and short to ground. You should measure infinite resistance to ground and across the pins. If incorrect, suspect a short circuit. Repair as necessary. Check for resistance across the solenoid valve pins. You should measure between 5 Ω and 15 Ω, depending on manufacturer and temperature. Check your manual for the proper specification. If incorrect, replace the valve. Check for resistance from the pins to ground. You should measure infinite resistance to ground. If incorrect, replace the valve. None found. Ask a question about P0080.